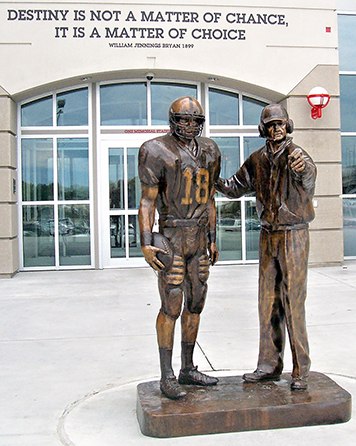 A life-size statue of legendary Nebraska football coach Tom Osborne stands outside the entrance to the Tom and Nancy Osborne Athletic Complex at North Stadium in Lincoln, Nebraska. Osborne is giving final instructions to a quarterback before he takes the field. The quarterback is Brook Berringer from Goodland. When the University of Nebraska wanted to honor Osborne with a statue, he wasn't very interested. But the sculptor, Fred Hoppe, suggested that he stand with Berringer. Osborne consented. Out of all the football players that Osborne had coached in his long Nebraska tenure, why Berringer? Berringer was born July 9, 1973, in Scottsbluff, Nebraska, the son of Warren and Jan Berringer. His father died when he was 7 and they moved to Goodland. Jan taught elementary school. The loss of his father taught Berringer sympathy for those in need. During his senior season at Goodland High, he threw for 979 yards and 13 touchdowns and was named all-league and all-state. During basketball season, he averaged nearly 20 points per game and the Cowboys qualified for the state tournament. 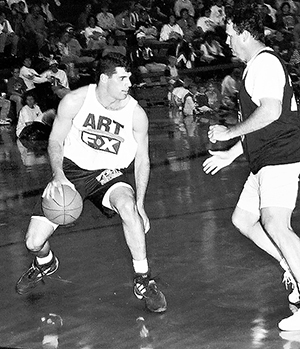 He was named all-state in basketball as well and is considered one of Kansas' greatest basketball players from the 1990s. As a state tournament qualifying team, the 1990-91 Cowboy basketball team earned a place on the wall in Max Jones Fieldhouse, home of Cowboy and Cowgirl athletics. Shortly before his graduation, the local newspaper interviewed senior athletes and their families about their plans for the future. Jan Berringer was asked what advice she would like to give her son. "Remember your family values," she said. Brook definitely remembered his family values. The 1995 Nebraska Football Recruiting and Media Guide called him "one of Nebraska's most active community leaders" and listed five organizations that he had volunteered for, "to name a few." He was always a magnet for children. When Berringer was at home during the school year, he would visit his mother's class. They loved him. Berringer backed up future College Football Hall of Famer Tommie Frazier and seemed destined to ride the bench as the Huskers aimed toward national titles. Then Frazier discovered blood clots in his leg before the fifth game of the season, against Wyoming. Berringer got the call. With 2:12 left before the half, he completed seven straight passes and scored from five yards out. On that drive, he sustained a partially collapsed left lung. That hit also cracked a rib. But he kept playing, leading the Huskers to a 42-32 victory. He wore a flak jacket the rest of the season. The Huskers inexplicably dropped a slot in the coaches' poll after the win, to No. 2, the same as in the Associated Press poll. Four games later, undefeated Colorado came to Lincoln. Nebraska was ranked second and third (coaches/AP) and Colorado third and second. Since Nebraska was without Frazier, Colorado was favored. Berringer led the Huskers to a 24-7 victory and Nebraska topped the AP poll again. Big Eight Conference named Berringer Offensive Player of the Week. The Huskers remained undefeated through the regular season. Berringer finished with 1,295 yards and 10 touchdowns passing, 279 yards and six touchdowns rushing. As Big Eight champion, Nebraska qualified to play Miami in the Orange Bowl. Berringer was named second team All-Big Eight by AP and honorable mention All-Big Eight by the coaches. In Goodland, people put stickers on their windows showing an 18, Berringer's number, in an orange. Frazier was cleared to play for the Orange Bowl and got the start again. But Nebraska trailed Miami 10-0 at the end of the first quarter. 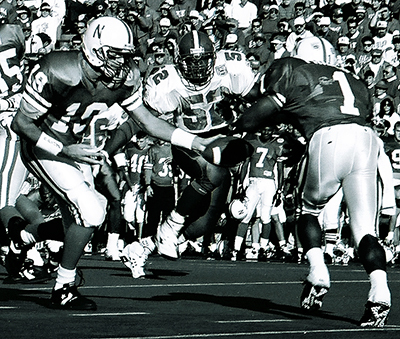 Berringer took over in the second quarter and got Nebraska on the board with a 19-yard pass to tight end Mark Gilman. TV cameras sought out Jan Berringer for her reaction. Late in the third, Berringer threw an interception. Frazier came back in for the fourth, leading the Huskers to a 24-17 victory. Nebraska was crowned National Champions. Frazier was healthy in 1995 and Berringer was once again relegated to the bench. It was frustrating, but Berringer was a team player. He accepted Osborne's decision and didn't try to undermine Frazier. He played in mop-up duty. He scored Nebraska's final touchdown in the blowout 1996 Fiesta Bowl. Nebraska defeated Florida 62-24 to win its second-straight National Championship. Berringer was an NFL prospect, rated more highly than Frazier, and was predicted to go in the middle rounds. After their eligibility is exhausted, Husker football players often form basketball teams and play for charitable causes around the state. Berringer's team finished their tour in Max Jones Fieldhouse about a week before the NFL Draft. The fieldhouse was packed. People had driven for hours to attend the game. He was more interested in and excited about his soon to be born niece than in his NFL prospects. Two days before the draft, April 18, 1996, Berringer took his friend Tobey Lake flying near Raymond, Nebraska. The plane rose about 250 feet in the air. Then it plummeted out of the sky and burned on impact. Osborne heard an announcement on his car radio about a plane crash that possibly involved a Husker player. He called Jan to warn her, then found his worst fears were true. They were dead. Husker Nation wept. Goodland wept. Nebraska's National Championship Celebration was canceled. Nearly 37,000 tickets had been sold. The athletic department donated the proceeds to a Berringer endowment fund. They offered to refund the $3 ticket price, but few chose that option. A video tribute played before the Spring Game. Players wept. Reporters sobbed. So did the fans. The NFL held a moment of silence before the draft. Berringer and Lake came home April 23, 1996. On the long drive from Lincoln, people lined the roads to pay tribute. The fieldhouse was packed. People had driven for hours to attend the funeral. Berringer's casket was topped with his helmet, Lake's with a heap of red roses. Goodland radio station KLOE broadcast the three-hour ceremony. The next day, the funeral was broadcast across Nebraska. U.S. Senator Bob Dole of Kansas inserted a tribute into the Congressional Record. Country group Sawyer Brown had met Berringer and had written The Nebraska Song about him. They performed a benefit concert at the 1997 Nebraska State Fair. Proceeds went to the endowment. Jan Berringer received over 10,000 pieces of mail, including one addressed to "Brook's Mom, Goodland, Kansas". In a retrospective 15 years later, Shatel said it well: "Berringer was the boy next door. Handsome, quiet, polite. He hailed from western Kansas, but this was a kid close to every Nebraskan's heart.… The son every Nebraska mother wanted. He had permission from every father in Nebraska to marry his daughter. 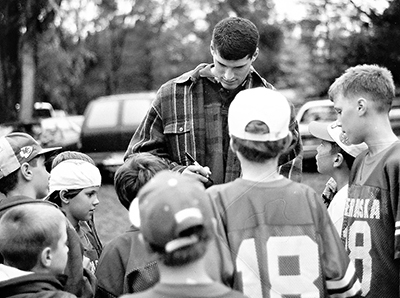 "Mostly, I think that some of us still gravitate to Berringer because of his selflessness.… The portrait of the team player.… And he resonated with so many because, well, that's how we would like to think we would have done it. There was an ideal there, a standard, that most preach about. Berringer lived it. Until the end." Nebraska football annually honors the Brook Berringer Citizenship Team, players who extensively serve in the community. Jan and Art Lindsay wrote One Final Pass, then updated it with One Final Pass: The Brook Berringer Story 15 Years Later. In 2013, KLIN Radio of Lincoln chose Berringer's 18 as part of its 50 in 50 preseason countdown. The documentary film Through These Gates, about what it means to be a Husker fan, features Berringer's story. In 2014, The Big Ten Network showed a documentary on Berringer's story, even though Nebraska was a Big Eight program at the time. Filmmaker Matthew Engel said, "What caught my attention was when Andy told me how hard it was to express the depth of reverence the entire state of Nebraska still has for Brook Berringer.... Why is Brook Berringer the one person held up as a symbol for the entire program and the state?" Engel and his partner Kevin Shaw sought to answer this question. In Goodland, a poster of Berringer stands in a Max Jones Fieldhouse trophy case across from the front entrance. The 1990-91 basketball team's picture hangs two west of the north door. Berringer wears No. 25. The fieldhouse is open during school hours, Monday-Friday, 7:30 a.m.-3:21 p.m. Mountain Time, and during evening and weekend practice times. Use the south door of the Arcade Avenue entrance. Someone decorates Berringer's grave with a Nebraska flag and Husker fans still leave mementos there. Goodland Cemetery at Armory Road and North Main is open 24 hours a day. A kiosk beside the cemetery chapel directs visitors to grave sites. A Berringer jersey and other memorabilia are in a case in Crazy R's Bar and Grill. Goodland Kiwanis Club erected two picnic shelters in Steever Park, 16th and Cherry, one in memory of Berringer and one in Lake's memory.